Kaufe Actionfigur Arsenal Soccerstarz Chanpions F.A. Actionfigur Arsenal Soccerstarz Chanpions F.A. 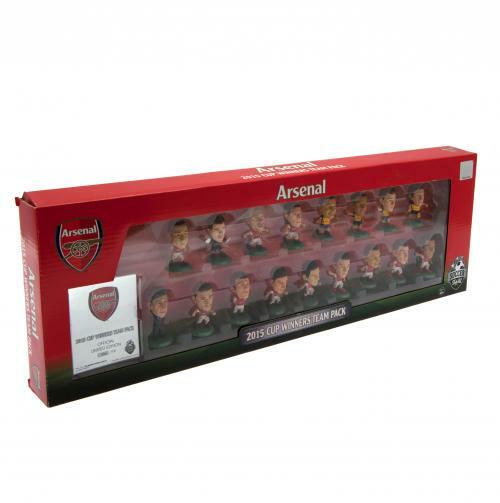 Actionfigur Arsenal Soccerstarz Chanpions F.A. Champions aus der F.A. Cup 2014/15. Enthalt: Cazorla, Szcesny, Mertesacker, Ozil, Oxlade-Chamberlain (away kit), Walcott (away kit), Ramsey (away kit), Ozil (away kit)- Wenger, Monreal, Wilshere, Giroud, Sanchez, Ramsey, Oxlade-Chamberlain, Koscielny, Walcott. Grosse: ca. 5 cm. Limited Edition. Nur 700 Stuck. Offizielles Produkt.